Artificial Selection is a form of selection in which humans actively choose which traits should be passed onto offspring. Humans have used selective breeding long before Darwin's Postulates and the discovery of genetics. Farmers chose cattle with beneficial traits such as larger size or producing more milk, and made them breed; and although they may have known nothing about genes, they knew that the beneficial traits could be heritable. The farmers selected for certain traits in their cattle and probably noticed that the offspring were becoming more and more productive with each generation. Scientists study these traits and spend a lot of time calculating how heritable these traits can be. The more these traits are expressed in the offspring (i.e. size, milk production, etc), the more heritable these traits are said to be. Hunting is also a form of artificial selection, with the genes that humans "want" (i.e. - the biggest buck with the most points, the largest fish, etc.) being removed from the gene pool, allowing the less "wanted" genes to pass on to the next generation by increasing their odds of mating when compared to the hunted specimens. Here is an interesting article that outlines some of the advantages and disadvantages of artificial selection. Here is a website from Berkeley outlining artificial selection. Here's an example of selective breeding on a farm. If one were to produce a type of hypoallergenic cat, how would one go about doing it? (Article) Start with a population of short-haired cats that have been tested with humans who are allergic to cats. Breed the cats that cause the least allergic reaction. Test the offspring with allergic humans and select the ones with the least effect. Continue choosing the least allergy-generating cats to reproduce. The traits that provoke allergies are weeded out, but the resulting breed will probably not be entirely hypoallergenic. Animals without fur are said to have fewer of the allergens that irritate and cause symptoms, however they aren't completely hypoallergenic. Breeders have also used selective breeding to create exotic pets. In this case, the breeder crossbreeds two different species-- such as the serval and the domestic cat to produce the Savannah cat. Like many other hybrids, many offspring are sterile. Most infertility in hybrids is caused by a difference in chromosome count between the species. F1 generation Savannahs are very difficult to produce due to differences in gestation time and picky mate selection in servals. This can lead to obvious problems that result in aborted pregnancies or kittens born prematurely. Many of the Savannah cats are back-crosses of the F1 to a serval, which produces a cat that is a higher percentage serval. The Savannahs are not all infertile, depending on their genetics, but male Savannahs are infertile until the F5 generation, while females are fertile from the F1 generation. This link shows what a Savannah cat is, along with other interesting hybrid pets! As purebred dogs are becoming increasingly inbred, problems are arising from a genetic standpoint. The frequency of being homozygous for rare recessive disorders increases when inbreeding occurs, potentially causing severe health problems down the road. Most, if not all, breeds of household dogs that exist today are due to artificial/selective breeding. The original bloodline is from wolf-like animals that were domesticated and bred for more docile traits. Now we have everything from mastiffs to poodles. Here is a link explaining this selection in greater detail. A notable fact about the speciation of dogs and wolves is that what we know as the domestic dog is actually a subspecies of the Gray wolf, Canis lupus; domestic dogs are known as Canis lupus familiarus. This study was begun in 1959 by a Soviet geneticist, who sought to replicate domestication practices in a species not domesticated before, the silver fox. Tameness was the only trait selected for throughout the study, which scientists still continue to do today. Now, the physical characteristics of the foxes have changed from the originals, ranging from a difference in coat color, to floppy ears, to eagerness to please the humans they interact with. 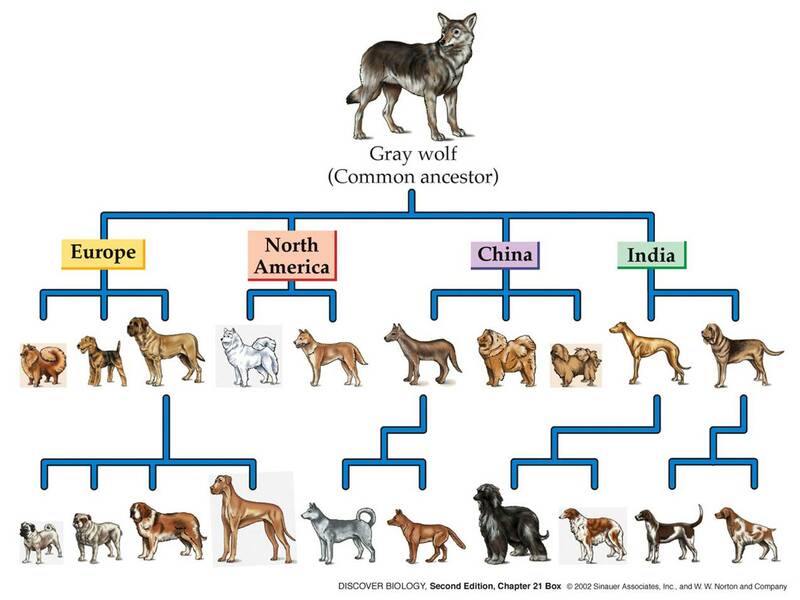 This article about how dogs evolved from a common ancestor with wolves suggests that old wolves evolved into domestication as they started living closer to humans. Dr. Ya-Ping Zhang suggests that wolves started scavenging from carcasses left by human populations. The more aggressive wolves would be killed while the more mellow wolves would be allowed to eat from the carcasses and stay in close proximity to humans. Domesticated dogs evolved their genes in many different directions than normal wolves, and many of these genes are active in dogs' brain. Many of these genes that underwent selection in domesticated dogs also underwent selection in human brains too. Another interesting and relevant fact about artificial selection: dogs have the widest range of phenotype of any mammal! The structure of the breed can help solve problems in regards to disease heterogeneity in humans. Here is a link to a BBC documentary that explains the issues with inbreeding dogs and the medical/health impact of selective breeding. These negative effects have spurred a movement for hybrid dogs recently as genetic diversity increases by combining two breeds of dogs. This picture gives a visual representation of the evolution of our beloved bulldog. The skull on the right is from 1800 and the left is from 1904, and represents the breed as we know it today. The New York Times even wrote an article about our beloved mascot's genetic transformation: "It is the most extreme example of genetic manipulation in the dog-breeding world that results in congenital and hereditary problems." Pug dogs that have been bred for certain traits often develop breathing problems. Is it right for breeders to continue this just for their own incomes? Watch this video to get some insight. NOTE: Not just pugs have problems due to breeding. Many pure breeds have problems. For example Labradors experience hip dysplasia, great danes have heart problems, etc. Many big dog breeds suffer from arthritis. Labradors often have problems with their hips. Here is a great Nature news article on the effect of human selection on the dog genome and its future implications. Dogs have a sliding genome composed of many, many transposable elements. Here is an article going into further detail about the genetics of dog breeding. Here is extra evidence of artificial selection in dogs. There has been artificial selection pressure on animals due to human intervention, first dating back to the use of castration to control the behavior of aggressive males. Additionally, in the early stages and in some species continuing today, humans routinely chose to kill and eat animals whose behavior was difficult to control before they had a chance to reproduce. For the time people have controlled domestic animals, the selective pressure has been related to the animals' behavior. At first, more tractable behavior occurred more as a consequence of human attempts to control behavior, not as planned, conscious acts to produce tamer, more tractable animals (Belyaev 1978). This unintentional selection also encouraged social behavior so that individuals that stayed together in herds and flocks were favored, as would individuals that exhibited tolerance to people. Other techniques employed since early stages of domestication, such as cross-fostering of young and early weaning, also affected maternal behavior of livestock. Domestic hens are known to be more likely to accept chicks hatched from eggs of other species than are wild birds (Lorenz 1965). Farmers continue to employ artificial selection. They breed animals in order to improve productivity and thus profits. For example, dairy farmers will look for the cows that can produce the most milk and only breed those cows. These cows then pass their genes that contribute to higher milk production onto their offspring, increasing productivity each generation for the farmers. Animation explaining selective breeding by farmers. Here is a Scholarly Article that focuses on showing the complexity of livestock domestication. Due to fishing regulations dictating that only the largest fish may be kept, humans are artificially selecting fish to produce smaller size fish. (Article) Originally there was great variation in fish size. As the population was fished, only large fish were removed, while smaller fish remained. Small fish reproduce and produce more small fish. Population will continue to decrease in size so long as the largest fish are harvested. "Slot limits" are often imposed preventing the harvest of fish over a certain size to counter this effect. Example: the wild mustard crop was artificially selected to cultivate many different popular crops. Here is another example that takes place right here on UGA's campus. It looks at bees as pollinators, as well as the reproductive success of apple orchards, blue berries, cantaloupe, cucumber, squash, watermelon, and more. Humans have been using agriculture and cross pollinating to manipulate the genomes of different plant species, especially wheat, whose chromosomal number increased as agriculture progressed. This kind of manipulation is responsible for foods like seedless watermelons and other seedless fruit. (for example: a banana is triploid, having 2 sets of chromosomes from one parent and 1 set of chromosomes from the other parent, these triploids don't really produce egg/sperm with balanced chromosomes so a seed set is rare thus leading to a banana with no seeds). The artificial breeding of crops over many centuries has led to humans using only a few strains of each of the major crops, such as corn, worldwide. This has raised concerns because if an epidemic passed through a certain strain or group of strains for one of mankind's major crops, such as ice or corn, it could destroy a huge portion of the world's food supply. As a result, many scientists stress the usage of a variety of crop species and the cultivation and preservation of the closest living relative to our food crops' ancestor. Tomatoes were bred from the size of blueberries to the modern size. Maize was bred from an unfamiliar tall grass-like plant called Teosinte. 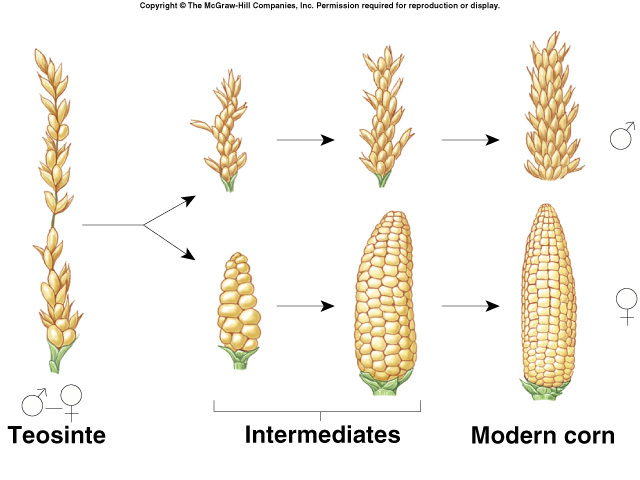 Larger and fuller kernels were selected for in order to allow the crop to be a more effective food source. Brassica olercea can be bred into broccoli, cauliflower, Brussels sprouts, cabbage, collard greens, and more. The Flavr Savr Tomato: The Flavr Savr tomato was the first genetically engineered food product to be released to the market. The goal of the Flavr Savr genetic alterations was to slow the ripening process, thus preventing the tomato from becoming soft, while still retaining its natural color and flavor. However, despite the tomato possessing these characteristics it was a huge failure. The tomato that was selected to experiment on was originally of inferior taste and flavor. The GMO tomato that was created was simply a more durable form of a terrible tomato. Interesting video telling how to identify GMO's. In the equation, 'R' is the response, or the average difference between a parent generation and the offspring generation, 'h^2' is narrow sense heritability, and 'S' is selection, which is the average difference between the parent generation and individuals selected to breed. Breeder's Equation asks, "If the environment selects for a heritable trait, how will the population respond (Wares 2013)?" Thus, the breeder's equation calculates the change in alleles between generations. The breeder's equation has been used innately for longer than the equation was created. Breeders have always selected and bred animals or crops that possessed favorable traits. Broad Sense Heritability (H^2) includes all types of genetic variance while Narrow Sense heritability only considers additive genetic variance. Some basic information through Duke University about the Breeder's Equation. Desired genotypes and phenotypes of various plant species can be achieved through the purposeful manipulation of breeding. This manipulation can include controlled pollination or genetic engineering (or both) followed by artificial selection of progeny. Many agencies believe that breeding new crops is essential to ensuring food security and developing plants more suitable to given environments. Classical plant breeding uses deliberate plant interbreeding to produce new crop varieties with desirable properties. Allows for the introduction of traits and/or genes from one variety or line into a new genetic background. Progeny would then be crossed with the high yielding parent to ensure that the progeny were most like the high yielding parent (backcrossing). Plants can also be crossed with themselves to produce inbred varieties. Artificial selection can create organisms that are dangerous to the population. For example, killer bees, also known as Africanized honey bees, were bred to produce more honey, but have killed a couple of people due to the unforeseen trait of increased aggressiveness being passed on. In some cases, like the banana, artificial selection has led to sterility. The author of this article argues against the ability to selectively breed and artificially select. Artificial selection also removes variation in a population (Nature of Life). Can cause harm to the animals that are being bred such as a shorter life span. This article describes a new approach to save coral reefs through selectively breeding corals which are more resistant to acidity and warmer temperatures. This approach is controversial because it is taking a serious issue and creating a temporary fix. Solutions should be sought in terms of lowering CO2 levels and restoring the oceans to their prior state. On the other hand, these types of changes may be unstoppable and thus having backup solutions such as selective breeding of corals will prove useful in retaining some level of the original community structure. how does this relate to H^2, broad sense heritability? Under the "Dog" section at the top in the first paragraph, don't the number of heritable diseases increase do to a higher chance of expressing homozygous recessive alleles (that lead to expression of diseases) in the offspring as opposed to more mutations due to inbreeding?